Consumers have more power than ever before. When making purchase decisions, they’re provided with endless options. To gain a competitive advantage, brands today need an in-depth understanding of who their consumers are. Brands need to move away from a brand-centric approach and focus on an audience-first approach in order to resonate with consumers and build meaningful connections. 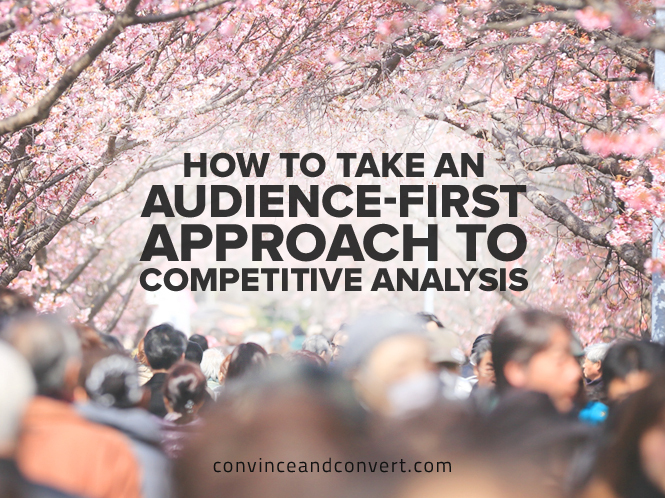 Competitive analysis rarely includes who your competitors are attracting with their efforts. Without knowing this, how can you understand their success? On social, competitive metrics have relied heavily on vanity metrics. The most prominent ways of benchmarking competitors involve tracking followers, likes, post frequency, content type, mentions, estimated impressions, etc. These metrics are easy to see and understand, but don’t actually provide value without context. The question surrounding competitors shouldn’t be, “How many followers do they have?” The question should be, “Who follows them?” A competitor could have ten times more followers than you. This can be intimidating. But what if 90% of their followers are irrelevant? What if they are followers that are outside of your target audience who are unlikely to purchase or create action? Conversely, what if 90% of your own audience is the ideal target market? All of a sudden, when comparing in context, your audience is much more valuable. Affinio’s algorithm looks at the billions of network connections that exist within an audience, then groups individuals with similar interests into clusters for further analysis. 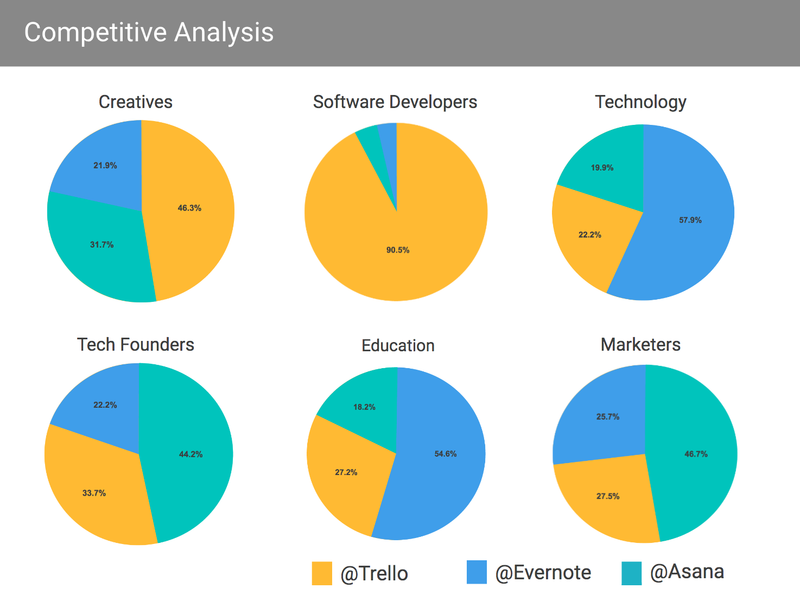 In this case, I analyzed anyone who follows @Trello, @Evernote, and/or @Asana. The audience visualization below shows us the interest-based communities within this audience and the relationships among them. 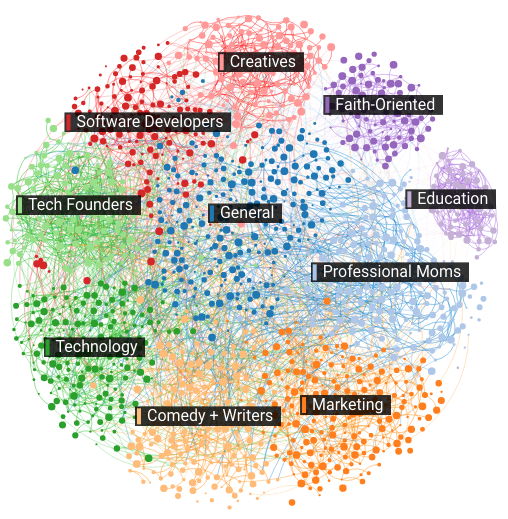 Audience visualization of Trello, Evernote, and Asana Twitter followers. Let’s say you work in marketing at Trello. You have about 113k followers on Twitter, while Asana and Evernote have 104k and 430k, respectively. While you are neck-and-neck with Asana, Evernote has four times more followers. Does this matter? How much attention should you be placing on Evernote versus Asana? Let’s say that out of these communities, your target audience includes Creatives, Software Developers, Technology, Tech Founders, Education, and Marketers. Below are the breakdowns of each community that show which brand “owns” each of these communities. Of the communities in your target audience, you dominate the market share in Software Developers and Creatives. You are competitive in Tech Founders, but are falling behind in Technology, Education, and Marketers. You now know where you stand in each of these communities in the context of who the followers are. The playing field is no longer determined by vanity metrics, but by the quality of audience. While you may have initially thought that Evernote is the main competitor to concentrate on, this is only true in Education and Technology, as Asana has the market cornered in Tech Founders and Marketers. While it’s clear that your content and current efforts resonate with the Software Developers and Creatives, it’s not hitting home with the Tech Founders community. To solve this, you need to learn more about what makes these people tick. Looking into each community, we can learn more about their interests, the content they share, how they self-describe, and the hashtags they use regularly. As an example, let’s look into how Trello could expand into the Tech Founders community. This section is highly valuable. If you are not a Tech Founder (or related), this is a sneak peak into the culture of this community. 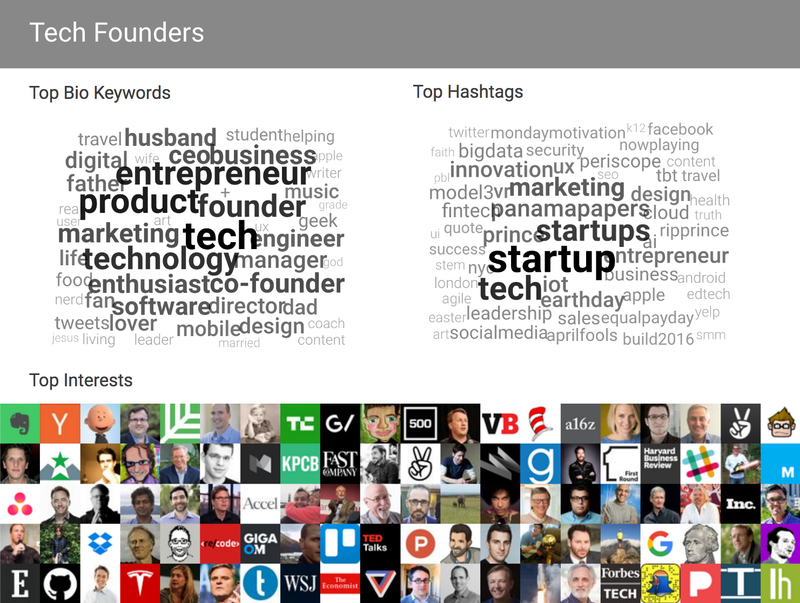 These are the top one hundred contextually relevant accounts to Tech Founders that follow these project management accounts. We can learn so much here. We can see other products they like, the top influencers that are relevant to them, where they go to get their news, etc. This shows you how this community self-describes. Some people in the community define themselves simply as “Founder,” while other top descriptors include “entrepreneur,” “technology,” “software,” “product,” “CEO,” etc. This helps you identify members of this community. By identifying the top hashtags used by this community, you can start monitoring them to understand how this community communicates and understand further what is important to them. You can also use these hashtags to grab their attention and start conversations. This interest-based data arms you with the right tools to activate this audience. While at first it was intimidating to think that Evernote had four times more followers than you (which normally means the rest of the vanity metrics are also quite high), you now understand where you stand on a contextual playing field. Taking an audience-first approach allows you to truly understand the value of your audience as well as your competitor’s audience. Ditch those vanity metrics to truly understand how you compare to competitors in a way that matters. By concentrating on the audience, you are able to break through the noise, activate audiences, and make meaningful connections.